A pre-dawn start had me heading east on a dark and desolate road. This road was to lead me to great things on the Atlantic Ocean. Having never visited a wildlife refuge in Florida before, I was in for quite a birding extravaganza. Of course, silly me had neglected to pay attention to the weather, nor bothered to have mosquito repellant in the car. But nevertheless, my time in Florida is short, and short of a hurricane, there was no way I wasn’t going to get there. The morning started completely overcast with winds blowing hard and strong. Large flocks of birds were flying overhead, many unidentifiable for me. 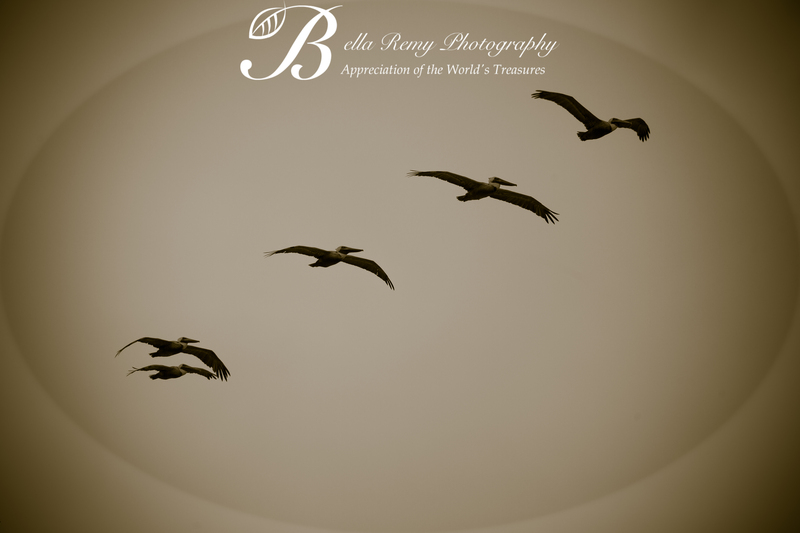 At least I did recognize these Brown Pelicans. 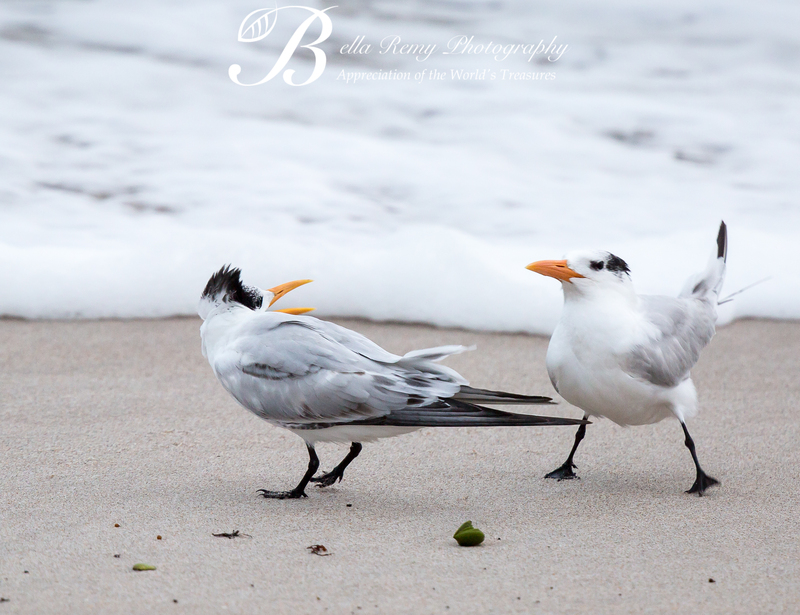 The wind was brisk, blowing the feathers practically off of these Royal Terns. It was funny to watch the sanderlings run sideways as the wind nearly toppled them over. The wind was a bit much for me, so I headed back towards inland. Merritt Island National Wildlife Refuge is an enormous place, and there are so many nooks and crannies to explore. One could spend a month here and still not see every part of the Florida wilderness. Driving down the road, something black with four legs caught my eye. What? Are they dogs? 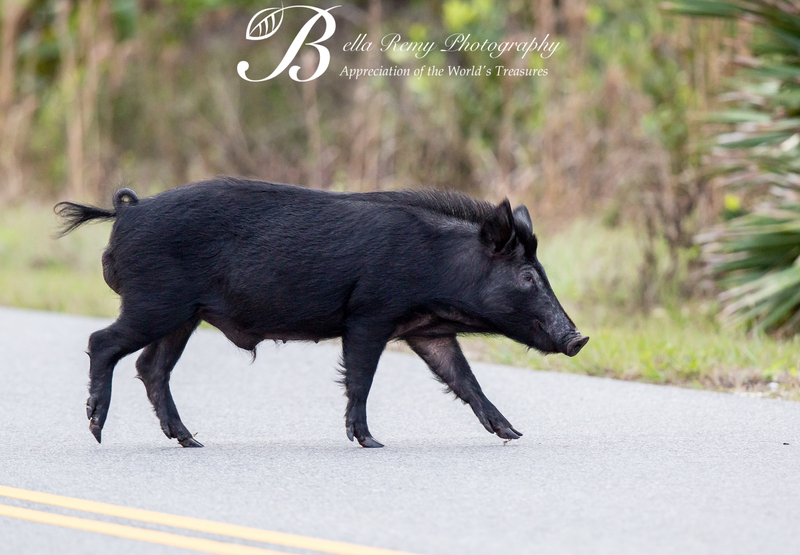 Nope – there are Wild Pigs that live on the Island. Left by the Spaniards long ago, these feral pigs have lots of babies each year. They are destructive and invasive, but still have their cute curly tails. Along my way, I saw a pond filled with a wide variety of herons and egrets. Now this is where the mosquito spray would have been handy. A bit of a marshy area, the mosquitoes came out in full force. These mosquitoes were huge! It’s as if these bugs were given steroids. Big suckers they were. But I still managed to dance my way between bug bites to capture some beauties. But I was far from done with discovering beautiful birds today. Stopping at the visitors center to get some information and a map, I learned that Painted Buntings enjoyed eating at the feeders just out the back. Such stunning birds these are. As if I wasn’t already having a fantastic day with birds. Even more came to get their picture taken. 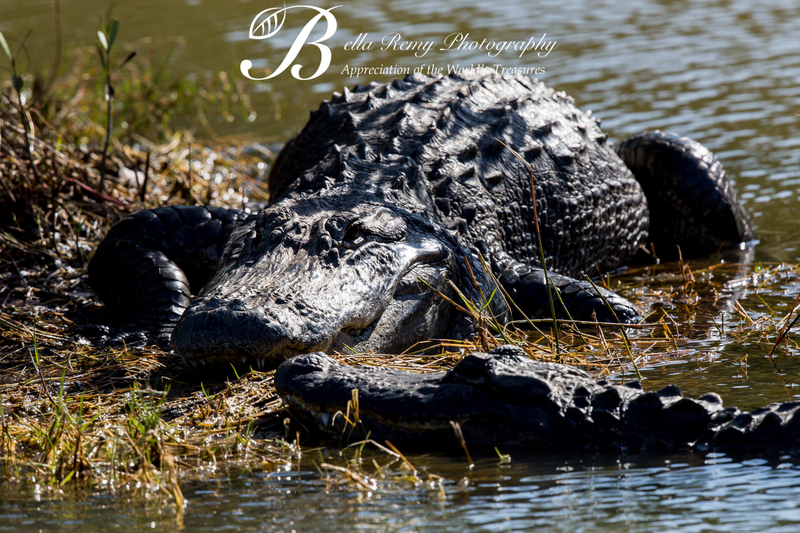 And there were more..much more, but I think I’ll restrain myself, and leave you with a Florida alligator. No trip to Florida is complete without one. Thank you so much Abozdar. Appreciate your visit and hope to see you back soon. This time I didn’t get too close to the gator. Somehow this one looks pretty dangerous. Thank you so much for your kind words Mark. Now that’s a great day of birding! Well worth a few skeeter bites.Loved the photo of the painted bunting the most, but they’re all great. A tip for you, there’s always a bottle of insect repellent in the map pocket of any vehicle I own. LOL ! Agreed, each of my cars have bug repellent in them. Alas, I’m in hubby’s car on this trip and am not properly equipped. Of course I could buy a can, but where’s the fun in that? What a beautiful series and fruitful trip. Worth the mosquito bites I think … but that is easy for me to say! I absolutely agree Denise. I really didn’t want to leave but the 30+ mph winds chased me away. Thank you so much for your compliment. What a GREAT day of birding. The Painted Bunting alone would have made my day. As for my favorite photos of the day, it has to be the Great Egret standing on the exposed trunk… or for comic value, the Royal Terns who look as if their black toupees are about to fly off. Thanks for sharing! LOL! That is funny. Now crows aren’t all that bad. Surely you have more than just those big guys. Frogs are awesome !! I love frogs!! I could spend weeks here photographing. The wildlife is truly amazing here. Thank you so much and you too watch the gators. What a great variety of sights!! I love seeing these beautiful creatures through your lens! I think that little pig is just the cutest, even if he is destructive! 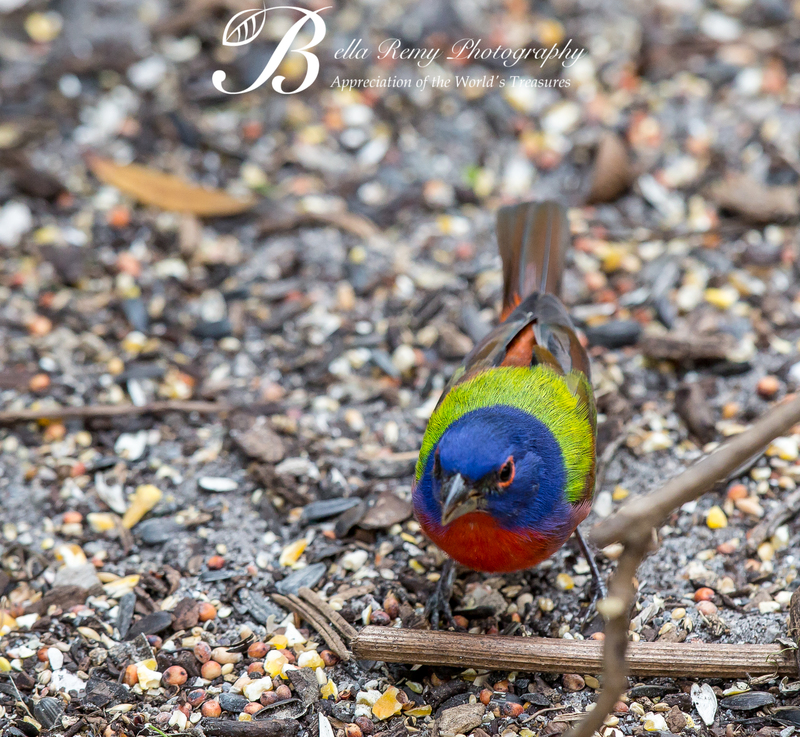 That painted bunting looks so kewl! Mosquitoes and alligators! What a day! My sympathy there (with the mosquitoes, that is). I haven’t forgotten my stay in La Camargue ranch yet: I can still hear them at night. Brilliant pictures, as always. Thanks for sharing. The birds are absolutely beautiful and the Pig… priceless!